Sam Shepard was arguably America’s finest working dramatist, as well as an accomplished screenwriter, actor, and director. Winner of a Pulitzer Prize, he wrote more than forty-five plays, including True West, Fool for Love, and Buried Child. Shepard also appeared in more than fifty films, beginning with Terrence Malick’s Days of Heaven, and was nominated for an Academy Award for his performance in The Right Stuff. Despite the publicity his work and life attracted, however, Shepard remained a strongly private man who said many times that he would never write a memoir. But he did write intensively about his inner life and creative work to his former father-in-law and housemate, Johnny Dark, who was Shepard’s closest friend, surrogate brother (they were nearly the same age), and even artistic muse. 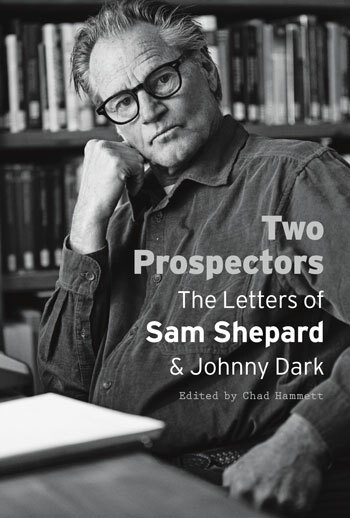 Two Prospectors gathers nearly forty years of correspondence and transcribed conversations between Shepard and Dark. In these gripping, sometimes gut-wrenching letters, the men open themselves to each other with amazing honesty. Shepard’s letters give us the deepest look we will ever get into his personal philosophy and creative process, while in Dark’s letters we discover insights into Shepard’s character that only an intimate friend could provide. The writers also reflect on the books and authors that stimulate their thinking, their relationships with women (including Shepard’s anguished decision to leave his wife and son—Dark’s stepdaughter and grandson—for actress Jessica Lange), personal struggles, and accumulating years. Illustrated with Dark’s candid, revealing photographs of Shepard and their mutual family across many years, as well as facsimiles of numerous letters, Two Prospectors is a compelling portrait of a complex friendship that anchored both lives for decades, a friendship also poignantly captured in Treva Wurmfeld’s film, Shepard & Dark. Chad Hammett teaches at Texas State University–San Marcos, from which he received an M.F.A. in fiction.